Replacing a low-rise POS with a taller McSam POS seems redundant. I'd rather have the low-rise then, because it'll be easier to get rid of in the future. I think one of the low-rise POS will be part of the McSam Hotel site, but it seems that it won't take down one or two of the POS that abut the beauty at the corner. That's a shame. Those filthy little P's O S really detract from the masterpiece on the corner. Ugh, another McSam. It's like an endless line of these things. And there so ugly, guuuuuh . You'll have more luck with the address 311 West Broadway. Curbed called it a five-story Gwathmey Siegel building over a garage, which I believe, but then Lockhart very publicly changed his mind, saying new intel was coming soon . . Thanks for the info, Lofter. I thought that Gwathalmy Siegel was the architect. I may be wrong, but I believe he is the architect for a larger development adjacent to this property. 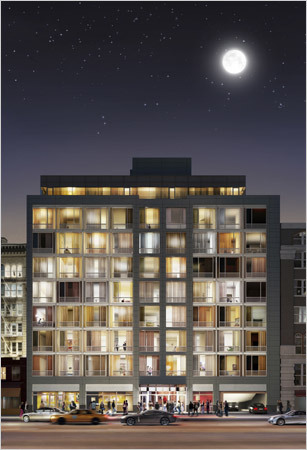 I dug up these renderings of a project called 311 West Broadway on Gwathmey Siegel's website. It seems there are two separate projects on this one lot, by two different architects. 311 West Broadway is a residential condominium in New York City’s Soho Cast Iron Historic District. 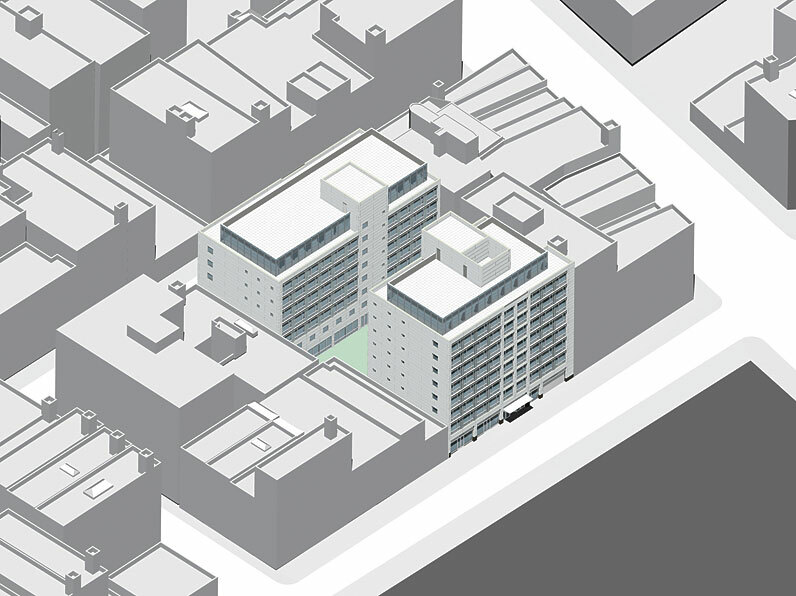 The two-building project consists of a nine-story structure facing West Broadway and an eight-story one facing Wooster Street, with a shared courtyard mews between them. The 175,000-square-foot project offers 5,000 square feet of commercial space, 63 luxury apartments and underground parking. The design features a stone base, metal panels and floor to ceiling glass with horizontal and vertical channels expressing floor slabs and columns. 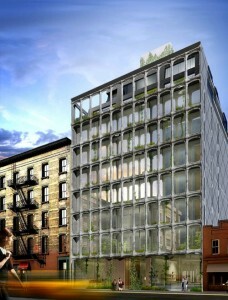 The metal and glass facade recalls the evolution of these materials in the Soho Cast Iron Historic District. Three different types of glass are used—clear, frosted and fritted - to give a sense of layered depth to the facade. The buildings’ massing relates to the specific scale of West Broadway and Wooster Street and maintains the continuity of the street wall. The project is called SoHo Mews, and it's got a website up and running (not much on it though). If I've got this figured out right, the Gwathmey development will go on that lot. The other development (325-329 Broadway) will go on the other side of the two-story building with the awning (which will remain). That's also the project that had some difficulty getting approval from Landmarks (chronicled on the previous page). Last edited by pianoman11686; May 15th, 2007 at 04:11 PM. 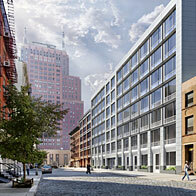 SOHO is not exactly thought of as the most welcoming place for new development. But sometimes, the neighborhood does get along with developers. There has been close cooperation between the neighborhood and a developer and architecture team on a project under construction on the largest buildable site left in the area, called SoHo Mews. The luxury residential development will consist of a condo building on West Broadway, town houses that front Wooster Street, and a courtyard in between. “It is rare, if not unique, where a developer and an architect worked so closely with the community,” said Sean Sweeney, the director of the SoHo Alliance, an umbrella organization of community groups. The developer, United American Land, is a family-owned company run by the Laboz brothers — Albert, Jason and Jody — who have owned property in SoHo for years, but had not undertaken a project of this magnitude in the neighborhood. United American Land bought what had been a parking lot just north of Canal Street more than two years ago, and immediately began talking with Gwathmey Siegel & Associates Architects to design a modern interpretation of the famed cast-iron buildings in SoHo. The result will be two buildings totaling 175,000 square feet, with 68 luxury units, priced at $2.1 million to $11 million. 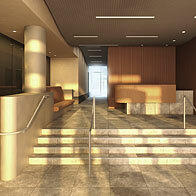 The ground floor of the West Broadway building houses the main residential lobby as well as stores and an entry to an underground parking garage. In both buildings, the floors above will have two- and three-bedroom loft units overlooking the street and the interior courtyard from floor-to-ceiling windows. On the top setback floors of the buildings are four glass penthouse units with wraparound terraces. The Wooster Street building has five town houses at its base in deference to the street’s quieter low-rise character. The town houses are three-, four- or five-bedrooms with private entries. Each town house has a secluded backyard, set within the landscaped courtyard, that is accessible through an industrial-inspired nesting glass wall system that opens the interior to the outside. The collaborative process behind the SoHo Mews is also likely to mean it will get a better reception from its neighbors than did the Sculpture for Living at Astor Place, the Gwathmey Siegel luxury condo building that landed like a spaceship in the East Village, was reviewed poorly and did not sell well. Charles Gwathmey took issue with that characterization, but agreed that the projects are different. Indeed, it is the streetscape orientation, or the facade on West Broadway, that steals the show. The architects sought to simulate the depth of the cast-iron facades, which take up a lot of floor space, through detailing, including three types of glass, and by breaking the building’s front into three parts, with a center that is vertically oriented and has two flanking sides. The stone base and curtain wall of metal panels and recessed glass allude to but do not overtly mimic classic SoHo materials and design. “This facade is going to emit and absorb different light, day and night, because of the different glasses and the way the structure is articulated,” Mr. Gwathmey said. The interior courtyard will be designed by Peter Walker, who is doing the World Trade Center memorial landscape design. There will also be a small but public gallery space run by the Art Production Fund, a SoHo-based nonprofit arts group, which will also curate work to be displayed in the courtyard and throughout open spaces in the building. SoHo Mews is only the second building to go through a permitting process implemented in 2003 specific to the area. It came about after many fights involving residents, developers and the city. The new rules mandate that all new apartments are a minimum of 1,200 square feet, and that no new eating and drinking establishments are allowed, among other bulk and height limits. In addition, all designs have to be seen by the Landmarks Preservation Commission, the city’s Department of Planning, the community board and neighborhood groups. “To go through this kind of a process and come out of it at the end so positive, it’s unique,” Mr. Siegel said. 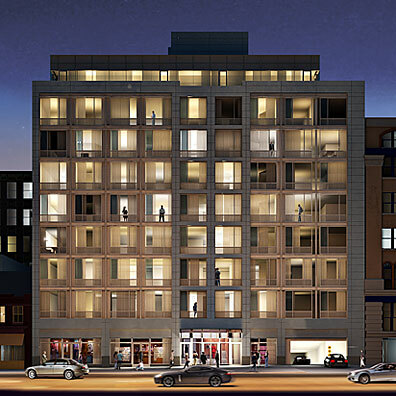 Construction has begun at 311 West Broadway, a 68-unit residential condominium project known as SoHo Mews. It is directly across from the SoHo Grand Hotel and extends through the block to Wooster Street. United American Land LLC of which Albert, Jason and Jody Laboz are principals are the developers. Gwathmey Siegel & Associates is the architect. 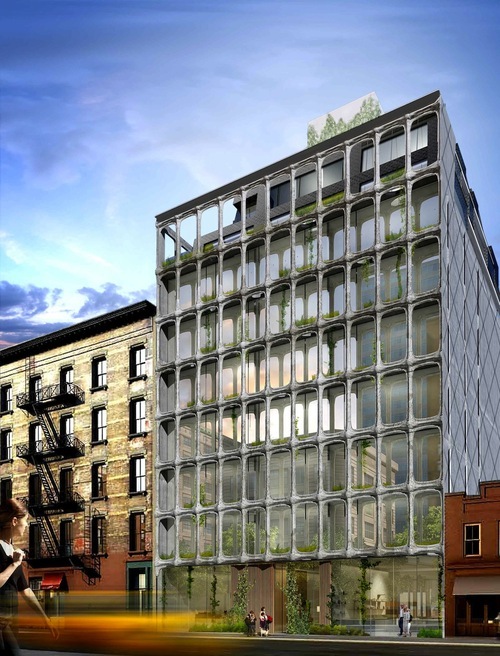 The Landmarks Preservation Commission has approved the plans, which it described as "an elegant interpretation of the SoHo aesthetic" and "a beautiful and supremely appropriate addition to the district." The metal-clad facades are rectangular grids with recessed windows that recall the district`s cast-iron architectural history. The marketing for the project emphasizes that its residents will become members of the New Museum of Contemporary Art and can avail themselves of an art information service provided by Art Production Fund, a non-profit organization that be on-site. Residents will also receive "shopping benefits" from Moss, a design store on Greene Street, Fort Street Studio, a carpet maker, and private exhibition previews at the Deitch Projects gallery. Public spaces in the lobbies and gardens at SoHo Mews will feature contemporary works commissioned by the Art Production Fund. The garden is being designed by Peter Walker. 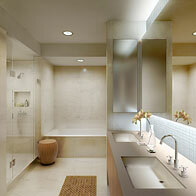 The development will have a garage and a 24-hour in-building concierge service provided by Luxury AttachHomes. There will be 59 two- and three-bedroom lofts with floor-to-ceiling windows, 5 two-story townhouses and four penthouses with terraces and outdoor spa features. Prices are expected to range from about $2,100,000 to $11,000,000 and occupancy in anticipated late next year. The project consists of a 9-story building fronting on West Broadway and an 8-story building facing Wooster Street. The old building at 325 West Broadway that will come down to make way for the Chocolate Factory. The West Broadway facade, with Justin's PH to the right. Two views of what's to come on West Broadway. The big condo plan for an old industrial building at 325 West Broadway, set to rise in the shadow of Justin Timberlake's Soho Mews penthouse, is alive once again. Dubbed the Chocolate Factory, this 9-story, 20-unit plan from architect Beyhan Karahan was first revealed back in the summer of 2008, but it hit the skids in the dark days of 2009. Now a new application has been filed at the Department of Buildings and demolition is imminent. The plan goes through the full block from West Broadway to Wooster Street, where two landmarked three-story brick buildings will be restored. A crew boring down to test the soil recently dug through the sidewalk just inches away from the old facades, a long-time canvas for street art of all sorts. The big parking lot next door at Grand and Wooster, where French artist JR installed one of his mega-portraits, has cleared out the car lifts to make way for scaffolding. Now that money is starting to flow, the transformation of this corner of Soho, where buildings were tilting no so long ago, is back in motion. This is great news. I walked by recently and was nauseated by this eyesore. It's particularly nice that they're restoring the old buildings on the east side of the site and keeping the little one just to the south. DDG Partners has unveiled new design plans for its Soho condominium conversion at 325 West Broadway, which now features a cast aluminum facade, Curbed reported.When DDG purchased the Chocolate Factory — a name that references its former use as a Tootsie Roll factory — for as much as $39 million, the property already had plans approved by the Landmarks Preservation Commission. But that didn’t stop DDG from making some major changes. The developer also solicited design plans from architecture students at the University of Virginia, as The Real Dealreported, though those plans will not be used. Yesterday, the firm released new plans by DDG’s in-house architect Peter Guthrie at a Landmarks public hearing. The plans call for the nine-story, 24-unit building to be draped in acast aluminum screen, covering a glass window wall. The ground floor retail space will be all glass, thus creating the illusion that the facade is floating. Construction is set to wrap up by 2015. Argh, we're getting painfully close to my fantasy building here. Prediction for the Next version: Uppermost grid will be gone, with the top two floors more restrained (aka boxier & set back farther). It's almost like a skilled architect is manipulating the LPC. Why I never! The Landmarks Preservation Commission raved over designs for a nine-story, 24-unit condo building at the site of the former Chocolate Factory when they were presented last week. In fact, the Commission had so few changes to suggest that DDG was able to implement them all and return the very next week (also known as yesterday). The very minor alterations included moving the lot line windows slightly and increasing the depth of the aluminum columns so that they're as alluring from inside the building as they are from the street. The LPC granted the plans unanimous approval officially signifying that, at long last, new condos will be coming to 325 West Broadway. Construction is expected to be completed in 2015.